BEACON FALLS — The Naugatuck boys swim team knew Tuesday’s final dual meet of the season against Woodland was an important last chance to swim competitively before the championship season. But longtime Naugy coach Jim McKee pointed to that meet against the Hawks as being critical for another reason. 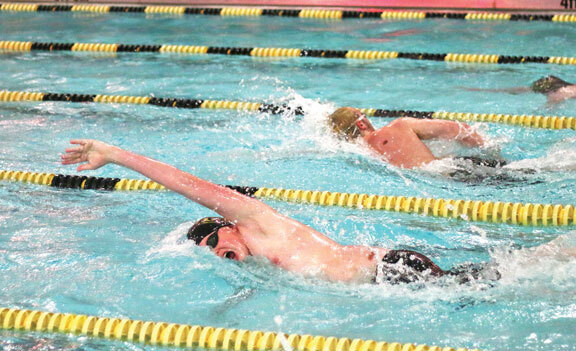 Naugatuck won the two relays that were officially scored, the 200 medley relay and the 200 freestyle relay. The Greyhounds also had two swimmers win multiple individual events. Spencer Maher claimed the 200 individual medley (2:08.75) and the 100 free (52.77 seconds), and Brian Goggin won the 50 free (23.12 seconds) and the 100 butterfly (57.04 seconds). Dale Wakeley also earned a win for Naugy in the 200 free (2:02.98), and Alex Manasoiu touched first in the 100 backstroke (1:04.44). 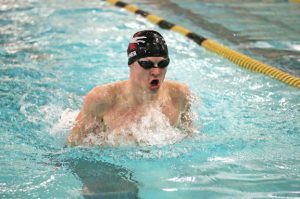 One thing McKee wanted to see from the Greyhounds in their final meet was continued progress from his long-distance swimmers. Woodland also had three individual winners. Riley Clark took the diving event with 226.05 points in his last competition before attempting to defend his Naugatuck Valley League championship. Zack Arisian claimed the 500 free (5:53.52) and Greg Aldrich won the 100 breaststroke (1:08.12). Now, both teams’ efforts will be focused on preparing for the NVL championships. The swim trials are set for Feb. 27, with the diving finals Feb. 28 and the swim finals March 2. One part of the prep for coaches is figuring out who will swim in which events. During the two-week layoff, swimmers can expect a whole lot of work before tapering in the days leading up to the championships.